At Timothy Off, we know how important your thermostat is when it comes to controlling the comfort of your home or building. 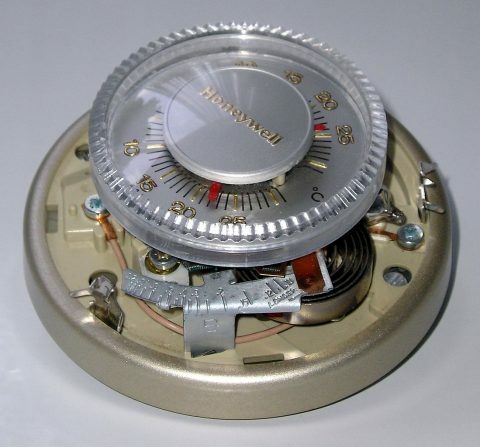 As commercial and residential HVAC experts, we can repair your thermostat. We want it to work properly and if you’re experiencing trouble with it, we’re here to make things right. Anticipator issues: If your heat or air conditioning is cycling off and on too quickly or your unit never seems to reach the right temperature, you may need to adjust your anticipator. Balance: You may not know it, but your thermostat needs to be completely level in order to work properly. If it’s not, the mercury switch won’t operate as it should. Dirt/dust buildup: Sometimes dirt or dust buildup can prevent your thermostat from reading your room’s temperature correctly and in turn, the unit won’t turn on when it should. Bad wiring: Whether it’s a damaged or frayed wire or simply a loose connection, bad wiring can cause your thermostat to malfunction. Installation: Sometimes HVAC professionals aren’t that professional, and an inefficient installation can mean future problems for your thermostat. If you’re in need of a professional to diagnose your thermostat problem, don’t hesitate to call Timothy Off. We’ll inspect your unit and have it fixed quickly. Once your thermostat is repaired by our experts, you can reduce your carbon footprint by setting your thermostat a few degrees cooler in the winter and a few degrees warmer in the summer. Just this small change can save you money every month on your gas or electric bill and can help extend the lifespan of your thermostat.